What state was Ministry Of Sound in before it was sold to Sony? When Sony acquired Ministry Of Sound Recordings Ltd in August last year, it swooped for one of the UK music industry’s most successful independent labels. The deal, reportedly worth in the region of $55m, was probably the most talked-about British buyout since Universal swooped for ‘fourth major’ EMI Music for $1.9bn in 2012 (and Parlophone was subsequently sold to Warner). But what, exactly, was Sony buying? First there was the matter of a heavily respected A&R force – led by David Dollimore, now RCA Label Group chief at Sony, and Dipesh Parmar, recently named MD of Sony’s Ministry label (reporting into Dollimore). In addition, there’s major UK brand power in Ministry’s compilation portfolio; it could yet, if given room to breathe by the likes of Spotify, make its presence known on streaming services. Finally, there was Ministry’s small but impressive recorded music catalogue. This includes successful albums from Example, Wretch 32 and London Grammar, who returned this month with comeback single Rooting For You. Ministry Of Sound Recordings Ltd was a combination of these elements – yet it wasn’t without its difficulties. Primarily, that was down to a physical-led business model, which relied heavily on licensed compilations now facing stiff competition from curated streaming playlists. New data regarding MoS’s pre-sale financial state has now been released – and MBW has got its hands on it. An annual fiscal filing for Ministry Of Sound Recordings Ltd is currently unavailable (no doubt due to its sale). However, the firm’s former parent company, Ministry Of Sound Group Limited, has just issued full annual accounts for 2015 – and its strategic report provides top-level, pre-tax figures for its recordings division. By comparing this data with previous years, we can get a good indication of Ministry’s financial health a few months before Sony pressed the buy button. 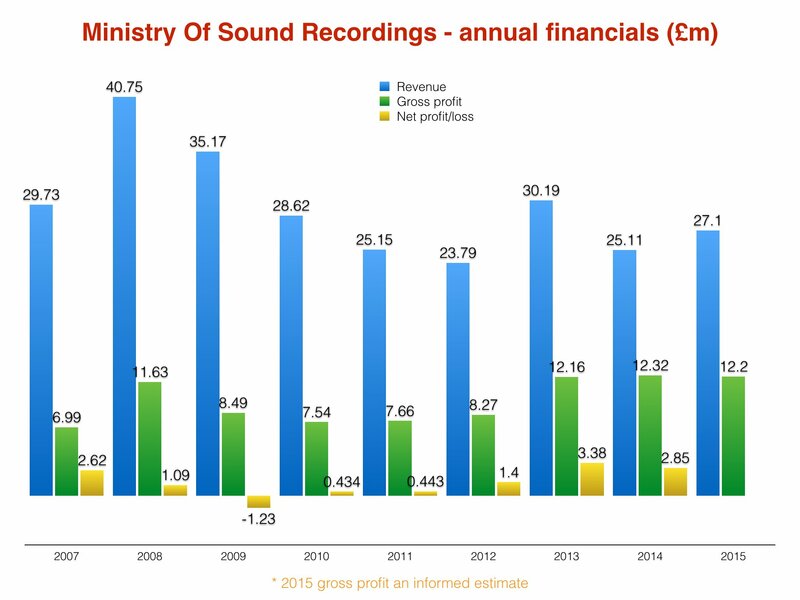 The first thing to know: in 2015, Ministry’s label turned over more revenue than it did in the prior year – up 8% to £27.10m ($33m) from £25.11m ($30.6m). In fact, 2015 was its biggest year in half a decade… if you discount 2013 (£30.19m turnover), when it enjoyed an especially stellar 12 months thanks to the platinum-selling debut album from London Grammar. Ministry’s Group report doesn’t give us any net/gross profit figures, but does tell us that the label’s gross profit margin in the year fell – from 49% in 2014 to 45%. 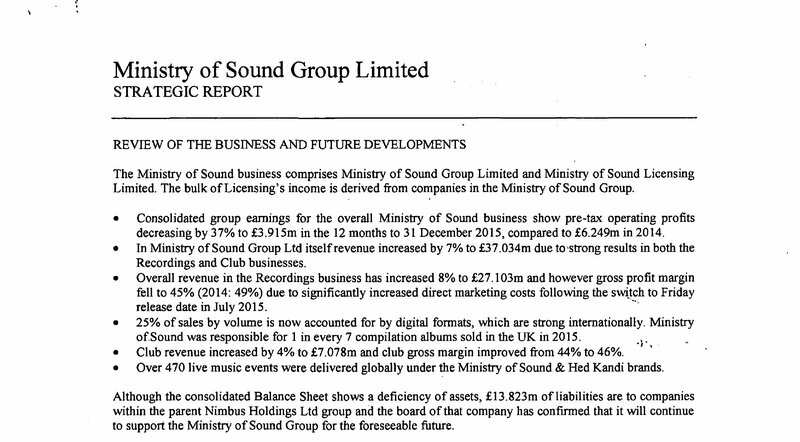 According to MBW’s calculations, that means the gross profit tally of Ministry Of Sound Recordings Ltd. would have dipped very slightly, down from £12.32m ($15m) in 2014 to around £12.2m ($14.9m) in 2015. Ministry’s parent Group blamed this fall on ‘direct marketing costs following the switch to [the global] Friday release date in July 2015’. Elsewhere, we learn a few facts about Sony’s biggest challenge with its new Ministry baby. According to the Ministry Group report, just 25% of its total recordings sales by volume in 2015 was generated by digital formats. Although it was said that these downloads/streams were “strong internationally”, the stat still shows the financial clout that MoS’s UK-focused CD compilations carried across the business. The report confirms that Ministry was responsible for one in every seven compilation albums sold in the UK in the year. We’ve already covered the fact that Ministry’s well-respected A&R team is about to get the chance to prove itself with a major’s budget on the global stage. There is no doubt that this was at the centre of Sony Music UK’s appetite to acquire the company.